Performance Time: Approximately 60 mins, 60 pgs. FARCE. Jack doesn’t like to practice his bagpipes. He just likes playing them. Jack’s bagpipe playing is so horrible, his parents can’t take it anymore. His mother can’t bring herself to tell Jack that she doesn’t like his playing, so Jack’s father encourages him to venture forth to share his “talent” with others. 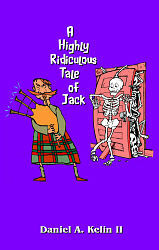 Jack leaves home, but his bagpipe tootling is so horrid it causes deaths all over the countryside. Jack’s bagpipe “music” even scares away a menacing revenant. Desperate to keep Jack away from the castle, the King consults his counselors?Wise One and Wise, Too?to find a way to rid the kingdom of Jack’s deadly bagpipe tootling. An overzealous knight, who wields a whopping weapon, is tasked to rid the countryside of Jack’s unbearable bagpipe playing once and for all. Screamingly hilarious! Daniel A. Kelin II is an award-winning playwright who has written, directed, and acted in plays performed in Asia, the Pacific, and the US. A series of his plays have been produced by the Honolulu Theatre for Youth. Mr. Kelin lives in Honolulu, Hawaii.